We are an unparalleled name in providing Hydraulic Press Brake to our valuable patrons, available at very economical price. This is also known as Press Brake Side Pillar Hydraulic Machine. ABL Friction Machine Tools Co.
We provide best quality Industrial Hydraulic Press Brake to our valued customers at reasonable rates. 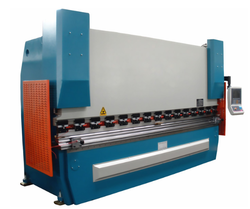 Our Hydraulic Press Brake have been designed & developed for continuous production & accuracy. The rigid frames are fabricated with tested plates, its interlocked construction with the bed directly supported on the side walls ensures consistent accuracy & perfect alignment. 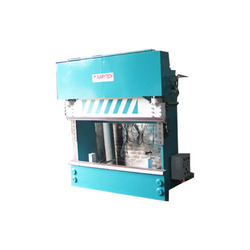 The hydraulic press brakes are suitable for edge bending. The most widely used method is air bending as different angles can be formed with the same set of tools with less tonnage. This press brake is especially designed for edge bending of S.S. kitchen sink. We are listed amidst the manufacturer of Hydraulic Press Brakes Machines. These hydraulic press brakes machines are manufactured using premium grade raw material obtained from trusted market vendors. The use of advanced machines ensure durable finishing of hydraulic press brake, which offers smooth functioning and maximum output. Hydraulic presses are the devices that use hydraulic cylinders to produce a compressive force. Essem Engineers is a proven and established leader known to manufacture and supply a wide variety of Hydraulic presses and machines. Our presses incorporate the latest hydraulic and electrical parts, offering wide operational functionality and flexibility. We are engaged in providing our clients with a wide range of Hydraulic Press Brake Machines (60-1500 ton). Manufactured using high grade material, these machines comply to the international quality standards. Widely applicable in various industrial segments, our machines are available in customized forms as per the specifications laid down by our clients.